My research centered on groups whose singular focus was promoting all manner of cyber fraud, but most especially those engaged in identity theft, spamming, account takeovers and credit card fraud. Virtually all of these groups advertised their intent by stating well-know terms of fraud in their group names, such as “botnet helpdesk,” “spamming,” “carding” (referring to credit card fraud), “DDoS” (distributed denial-of-service attacks), “tax refund fraud,” and account takeovers. KrebsOnSecurity’s research was far from exhaustive: For the most part, I only looked at groups that promoted fraudulent activities in the English language. Also, I ignored groups that had fewer than 25 members. As such, there may well be hundreds or thousands of other groups who openly promote fraud as their purpose of membership but which achieve greater stealth by masking their intent with variations on or mispellings of different cyber fraud slang terms. 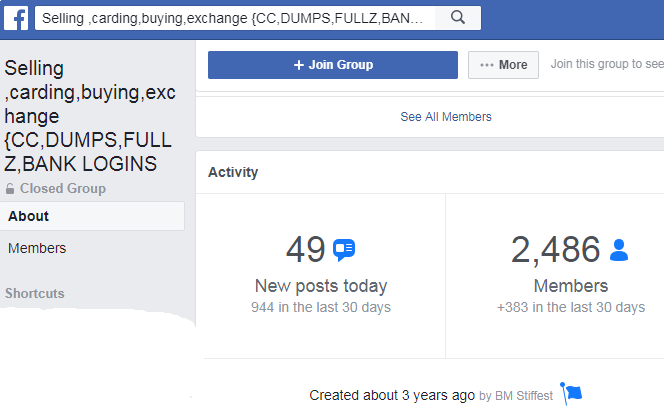 Facebook said its community standards policy does not allow the promotion or sale of illegal goods or services including credit card numbers or CVV numbers (stolen card details marketed for use in online fraud), and that once a violation is reported, its teams review a report and remove the offending post or group if it violates those policies. The company added that Facebook users can report suspected violations by loading a group’s page, clicking “…” in the top right and selecting “Report Group”. Users who wish to learn more about reporting abusive groups can visit facebook.com/report. Facebook’s stated newfound interest in cleaning up its platform comes as the social networking giant finds itself reeling from a scandal in which Cambridge Analytica, a political data firm, was found to have acquired access to private data on more than 50 million Facebook profiles — most of them scraped without user permission. This entry was posted on Monday, April 16th, 2018 at 6:38 pm	and is filed under A Little Sunshine, DDoS-for-Hire, Tax Refund Fraud.